Transforming a spare room into a master closet and work space. Converting a small room into a dream closet. This serene workspace is infused with interiors inspiration. This custom closet design features a place for everything. Part laundry room, part playroom—this double-duty space is full of fun ideas. Creating a sweet and exquisite twist on the traditional. A beautiful butler’s pantry organizes an impressive prop collection. Transforming an empty nook into an adorable and multi-functional kids’ corner. This walk-in closet strikes the perfect balance of storage and style. Read how we created order and calm in a once cramped space. How a custom walk-in revitalized a room. See how an underutilized closet becomes stylishly optimized for two. A smart redesign reveals a better use of space. Creating order for the quintessential craft space. Optimized design transforms a small space in a big way. Once a guest room, now her ultimate "girl space." Achieving a sophisticated walk-in closet with style. Creating an elevated home office space with equal parts function and style. From denim to dresses—a home for everything. Three teeny closets get a big makeover. Thinking outside the closet: a custom wardrobe solution. Transforming a catch-all bedroom into a master closet boutique. A custom design solution completes a laundry room’s fresh new look. Finally, the closet she's always dreamed of. Once a bathroom, now the perfect personalized closet. A custom walk-in closet tastefully designed for a busy couple. Character, style, and order bring this custom design to life. How we maximized space in a downsized apartment. A stunning dressing room retreat revealed. An adorable nursery that's effortlessly cool. Finally, a master walk-in closet to call her own. A sophisticated library design for a beautiful, beachside home. Enjoy the story of how this stunning walk-in closet came to life. See how we created new storage potential for a cramped closet. Beautiful and thoughtful design transform an extra room into a dreamy walk-in closet/convertible guest space. A neutral nursery reveals playful pops of color, personality and organization. A brand new home inspires exciting updates, including a modern, walk-in closet with office space. See how this enviable, contemporary pantry comes to life in a quintessential Victorian townhouse. See how we creatively solved the challenge of keeping a beloved shoe collection organized in a small space. Fresh and full of inspiration, this organized office strikes the perfect work-life balance. See how this multi-talented entrepreneur, maker and mom achieved an inviting room for guests where she can also work and craft creatively. For the 2016 Hampton Designer Showhouse presented by Traditional Home, California Closets revealed a refreshed twist on sophisticated hers and his closet spaces. A designer finally realizes her dream walk-in closet in her charming Manhattan studio. For Traditional Home’s 2016 Southern Style Now Showhouse, California Closets created a shared his & hers closet space optimized for style and function. In between their travels to source inspiration, this dynamic duo transformed their historic Regency-style home in North Carolina. 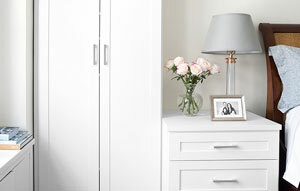 A chic closet refresh adds the finishing touch to whole-home renovation. A multi-closet renovation provides a family with the function they need with high-end details worthy of their home. The "White Collar" star's closet gets the celebrity treatment in this incredible before-and-after walk-in transformation.